Q. 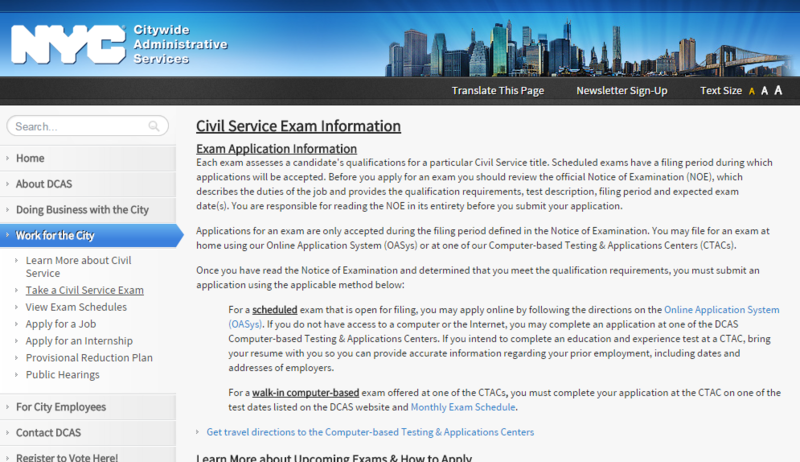 Where do I find information on upcoming Civil Service Exams? There are many places you can go for information on upcoming Civil Service Exams. Libraries in NYC, Brooklyn and White Plains all subscribe to a hard copy of The Chief, an NYC based weekly civil service newspaper that focusses on municipal government and its labor unions, and lists upcoming exams. While we do not have online access you may be interested in the NYC Government Website with a list of upcoming exams and how to apply. Each exam assesses a candidate's qualifications for a particular Civil Service title. Scheduled exams have a filing period during which applications will be accepted. Before you apply for an exam you should review the official Notice of Examination (NOE), which describes the duties of the job and provides the qualification requirements, test description, filing period and expected exam date(s). You are responsible for reading the NOE in its entirety before you submit your application. See the links below for more information on finding upcoming Civil Service Exams.